I've heard a lot of people complain that their meringue never works out. Usually the complaint is that they are too runny. Here is a basic recipe and some tips, that have never steered me wrong. 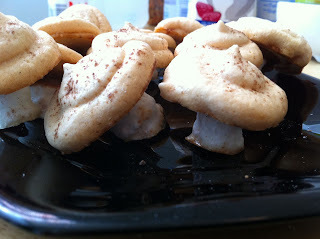 When you have the right stiffness of meringue you can have a lot of fun with them, even making mushrooms. In a large bowl beat the eggs with an egg beater at the high setting until white and frothy. Add the sugar slowly while continuing to beat. Once you have the mixture fairly stiff, add the vanilla and the vinegar Keep beating until the eggs are so stiff that you can safely tip the bowl upside down. Bake between at 225 degrees Farenheit for about 1 hour, until fully dried. If you want to make gooeyer meringue, you can add half a cup of corn syrup. This is especially true for when you make certain types of meringue cake. 1. Using room temperature eggs will double the yield of your meringue. It can also help to make sure your bowl is not cold. 2. When you separate out the egg whites, make sure there is no trace of egg yolk. Even a bit of yolk will keep your whites from stiffening. 3. Make sure none of your equipment is greasy. Like yolks, grease will keep the yolks from stiffening. 4. Some recipes call for creme de tartre instead of vinegar, but I have found vinegar to provide consistent results. Made these mushrooms when my egg beater broke and beat the whole thing by hand with a fork. The pain was worth it!